Federal agents on Monday captured one of the two convicted killers who escaped from an Arizona prison in Wyoming, and were still searching for the other inmate and a suspected accomplice. Tracy Province was arrested with a handgun in northwest Wyoming, about 60 miles outside of Yellowstone National Park, said David Gonzales, the U.S. Marshal for Arizona. Province's ten days on the run came to an end at 6:20 a.m., reports CBS News correspondent Ben Tracy. He was arrested at a motel after a woman whe talked to about odd jobs later recognized him. "As soon as she sat down on her couch up come the pictures of our escapees and she immediately identified him, positively identified him," Gonzales told CBS News. The other inmate, John McCluskey, as well as suspected accomplice Casslyn Welch, were still on the lam. "They consider themselves as Bonnie and Clyde," Gonzales said. "This is very, very serious business." McCluskey's mother was arrested on Saturday for giving him money and clothes while he is on the run. His steapfather says it's time for the manhunt to end. "You'll never realize what you've put your mother through--and me," a tearful Jack Washburn told CBS News. "Give yourself up." Efforts to find the trio intensified after they were linked to a double homicide in New Mexico. Province, McCluskey and Daniel Renwick escaped from a private, medium-security Arizona State Prison near Kingman on July 30 after authorities say the 44-year-old Welch threw wire cutters over the perimeter fence. Welch is McCluskey's fiancee and cousin. The three later kidnapped two semi-truck drivers at gunpoint and used the big rig to get away, authorities said. The group left the drivers unharmed in the truck at a stop just off Interstate 40 in Flagstaff and then fled. 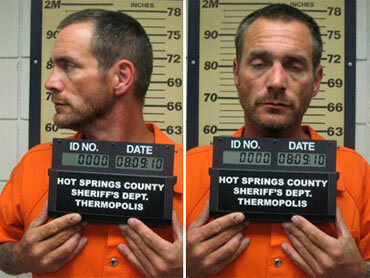 Renwick was arrested Aug. 1 in Colorado. The manhunt intensified Saturday after forensic evidence linked the two inmates and Welsh to the killings of an Oklahoma couple. New Mexico State Police spokesman Peter Olson declined to elaborate. The badly burned skeletal remains of Linda and Gary Haas - both 61 and from Tecumseh, Okla. - were found in a charred camper Wednesday morning on a remote ranch in eastern New Mexico. Their pickup truck was found later 100 miles west in Albuquerque. CBS News correspondent Ben Tracy reports that Province, McCluskey and Renwick escaped through a prison door that should have set off alarms, but didn't. Renwick was arrested in Colorado on Aug. 1. Renwick had been serving a 22-year sentence for second-degree murder. Publicizing their photographs in newspapers and on television, including a segment Saturday night on "America's Most Wanted," has helped generate tips, investigators said. A series of billboards featuring the three are also planned.